I'd been looking forward to Halloween all month. It would be the first Halloween where Hudson would actually "get it" and he'd been practicing saying "trick-or-treat" for two weeks. 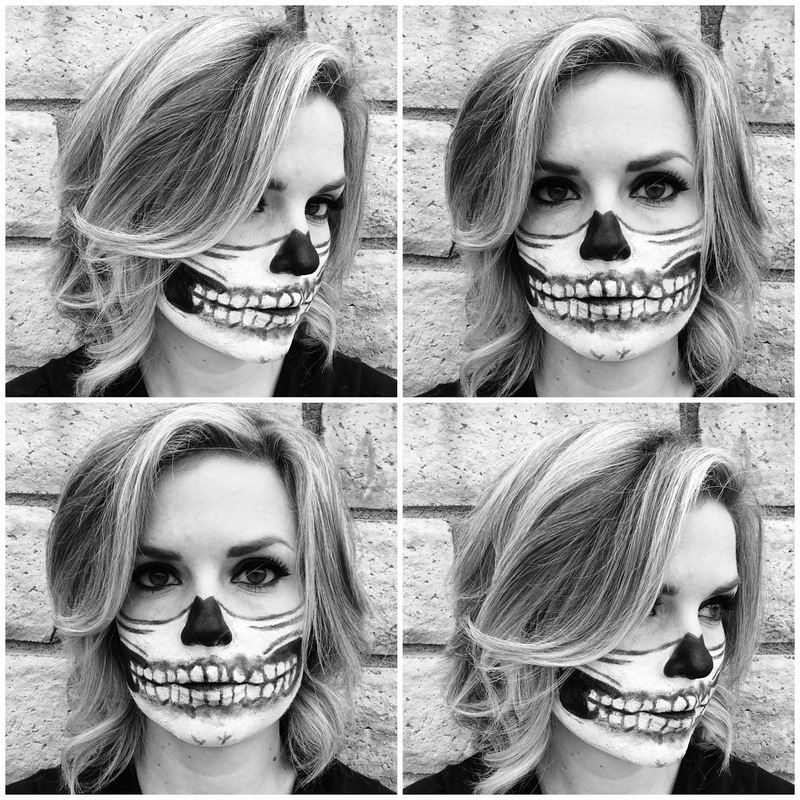 I woke up early the morning of to do my skeleton makeup, and was excited to try an all new skeleton makeup design. As I was leaving for work, nausea hit me, but I brushed it off as a usual pregnancy symptom. I had my prep. period in the morning, but as the morning progressed, I realized I was feeling worse and worse. I debated whether or not to go home. I felt a little silly leaving work and using a sick day for what I thought was just a pregnancy thing, but good thing I decided to leave, because once I got home the sickness hit me in full force and I threw up for the first time around 11:00am. I continued to throw up every few hours after that. I wasn't able to eat or drink without it coming back up. It was no fun. I am not one to get sick like this. Thankfully, Nathan nurtured me and took care of Hudson. They had been sick earlier in the week. All day I worried about whether or not we could take Hudson trick-or-treating. Nathan was tired and I was sick, but around 7:30pm I had a burst a energy and decided to take him out if only for a little while. I didn't want him to be robbed of that. Nathan decided to come along too, and I am so glad we were able to go if only for a little while because Hudson loved it. He strode up the the doors and either knocked or rang with confidence. He'd say, "'nand treat." He said hi to everyone and loved all the decorations. I only lasted about 15 minutes until I had to get back to bed. I exhausted myself a little, but it was worth it. Nathan finished up the last few houses with Hudson. Seeing Hudson having so much fun was exactly what I needed. Today I feel much better and I can eat and drink and keep it down. I'm just relaxing and taking it easy. Right now Hudson and I are watching Curious George in bed together. Hi Melody..enjoy both blogs you have & Congrats on your pregnancy. Did you end your other blog..Mommy Mirror Diaries? Again congrats..hope you are feeling great and enjoying life.